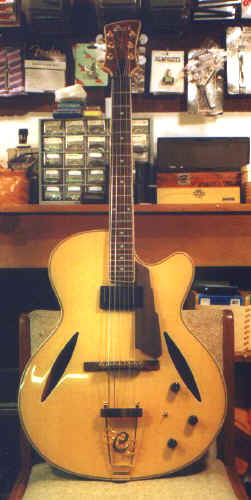 This past March (1999) Joe came by with his 1951 D'Angelico Archtop to have it overhauled. You can see more about this job at the "repairs" page. It needed everything! 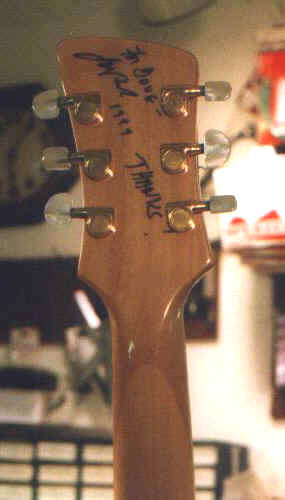 Frets, fingerboard work (parts of the fingerboard were only being held in by the frets), a new nut, all the parts were rusted - you name it. My first question was "When do you need this by?" He said he didn't need it for several weeks - after all he was just about to leave for Europe for almost five weeks, and he wasn't taking this guitar. He said he'd like it for when he got back for an album date, before leaving for Asia. "No Problem!" I got started right away (to get a jump on things). Joe called the next evening, "Hey Doug, you haven't started working on my D'Angelico yet have you?" - My answer - ""WHY?" - "Well the label were doing this album for wants to do the recording next Wednesday. "(Five days away) I told him that all the parts were off the guitar & soaking - the frets were out & half the fingerboard was on the floor (an exaggeration) but other than that he could still use it for the recording (a little sarcasm doesnt hurt now and again). Then the fatal question - "Is there any way..." you can figure out the rest. Well to make a long story short, it was ready for him by Monday - two days early - (I have to admit I was a wee bit ruffled for having to rush the guitar out). When Joe came by to pick it up he came bearing gifts. Below is a picture of what he brought. I had planned on buying an Alto already. Needless to say, I'm having great fun with it & I was very touched by the gesture. Thanks Joe! These guitars are no longer available but they do show up on ebay every once in a while. Definietly worth keeping an eye out for.